The 2018 Chris Sailer Kicking Spring Tour was an incredible success culminating with a tremendous Vegas XXXII Event. Now that the dust is beginning to settle, the question is… what next? 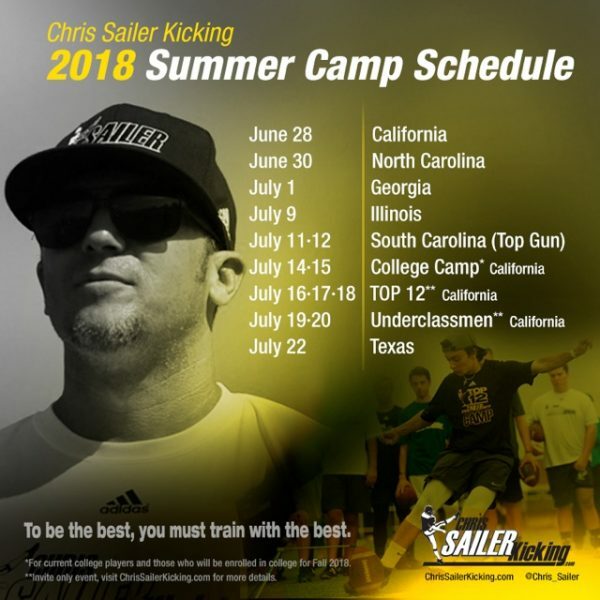 Chris Sailer Kicking has a huge 2018 Summer Schedule planned. Here is my advice! June: Attend 3-5 college camps. These are camps put on by the Universities themselves and are essentially tryouts. I cannot stress enough, go to camps that fit your athletic and academic skill set. DO NOT overdo it and attend too many of these camps. Avoid poor performances do to fatigue and worse yet injuries. *Attend 2 of these camps. 1) Attend the camp in your region. 2) Attend a camp outside of your region. Compete with others outside of your comfort zone and take the time to visit colleges in that area. Get experience traveling and getting to know another part of the country. This will go a long way in helping you making your college choice when that times comes. As a rising senior or junior college prospect this will greatly benefit you. July 11-12 – TOP GUN in Rock Hill, SC. This is your chance to try out to become a U.S. Army All-American or a Polynesian Bowl All-American. At this camp, I will be selecting 2 Kickers and 2 Punters for the U.S. Army All-American Bowl (The largest and most prestigious All-American Game in the world). 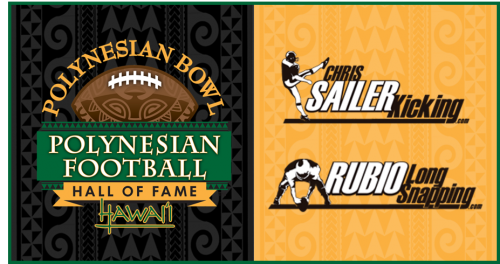 I will also be selecting 2 K/P’s for the Polynesian Bowl (The fastest rising All-American Game to be played in Hawaii). Chris Sailer Kicking rankings WILL be adjusted from the results of this camp. July 16-18 – TOP 12 (Invite Only Camp) in Los Angeles, CA. If you have been invited to this camp, this is a no-brainer. You are part of the most exclusive specialist club in the world! So…. your recommended plan is: 3-5 College Camps, TWO 1-Day CSK Regional Camp & TOP GUN! June: Attend 1 (max 2) College Camps. These camps are 99% intended to scout and evaluate the Class of 2019. You are going simply for experience. Unless you are a 5-Star, Top 5 nationally ranked CSK prospect, I would highly recommend waiting for these camps until you are a rising senior. I recommend going to 1 college camp simply to get experience. Focus your energy and resources on camps that will help get you prepared. *Attend the camp in your region. Possible consider attending an additional regional camp outside of your area to compete with others outside of your comfort zone and take the time to visit colleges in that area. Get experience traveling and getting to know another part of the country. July 19-20 – The 2018 Underclassmen Invitational in Los Angeles, CA. This is best camp that you will ever attend during your time in High School. This camp is as much for the parents as it is for the players. If you get invited to this camp, this is the CAN’T MISS camp of the summer. Instruction, competition, rankings, seminars, friendships and fun. Get ready for greatness! So…. your recommended plan is: 1 (max 2) College Camps, ONE 1-Day CSK Regional Camp (possible 2) & the 2018 Underclassmen Invitational. June: Private and Group Training with Chris Sailer Kicking Staff Members. DO NOT attend College Camps. These are not beneficial for you at this time. Focus on getting better to prepare for the future. *Attend the camp in your region. 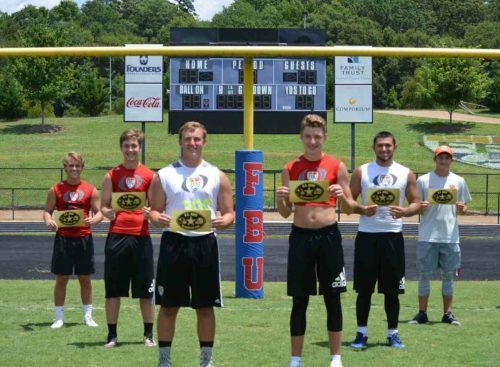 July 11-12 – TOP GUN in Rock Hill, SC. This is your chance to become an Adidas Freshman All-American (Class of 2022). I will be selecting 2 K/P’s to participate in this incredible game at TOP GUN. If you are in the Class of 2022 this is a can’t miss. For all other youth players (2023 and younger): we feature a youth division at this camp which is unique to any other camp that we run. This is an incredible opportunity to improve your skills and have fun with others your age. So…. your recommended plan is: private and group training, ONE 1-Day CSK Regional Camp, TOP GUN & The 2018 Underclassmen Invitational.